Enhance your home, decrease your energy costs and add sun protection with Eastside Awning's solar shades and residential awnings. Reduce sun glare while maintaining your fantastic view with solar screens and retractable awnings. Add rain and sun protection to your business. Increase the value of your property. The most respected awning company on the Eastside. Quality workmanship, customer satisfaction and personal service make us the Eastside’s premier awning company. Eastside Tent & Awning Company has proudly provided high quality awnings and sun protection solutions to the greater Eastside and Seattle area for over 40 years. 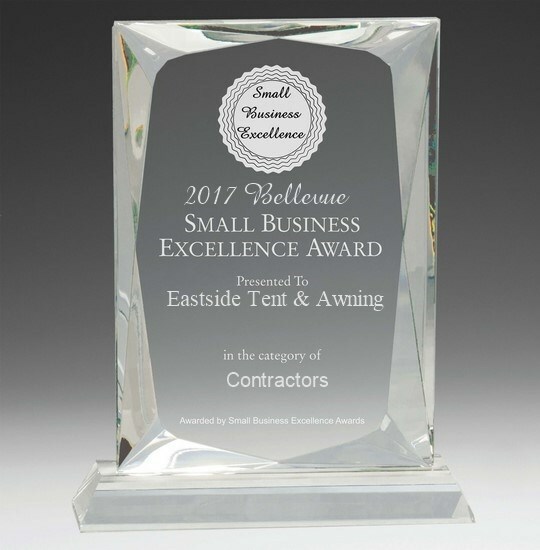 Our company, the recipient of the 2017 Bellevue Small Business Excellence Award, has been family owned and operated at the same location in Bellevue, Washington since 1963. We specialize in both retractable and fixed awnings for your home or business. We're the recipient of the 2017 Bellevue Small Business Excellence Award.